Varieties: The UNMIK and Kosovo Post organizations did not deliberately produce many varieties of any one stamp. However, the contract printers were not particularly careful about inking. Many issues show various mixes and shades of color, so, for the most part, these are ignored on this site. An exception has been made for the Fauna souvenir sheet of 2006, which appears with both very dark green background color as well as very light green background. The Kosovo Ministry of Communication confirmed that there are two printings in different colors of green. On the "Mint Stamps & Sets" page, issues printed by more than one printer are noted where stamps exist showing differing printer's names. These are classified and noted here as two completely different stamp issues on that page and are not duplicated in this Errors & Varieties page. The situation is the same with respect to the Fauna souvenir sheet mentioned above. Imperforate Stamps and Souvenir Sheets. 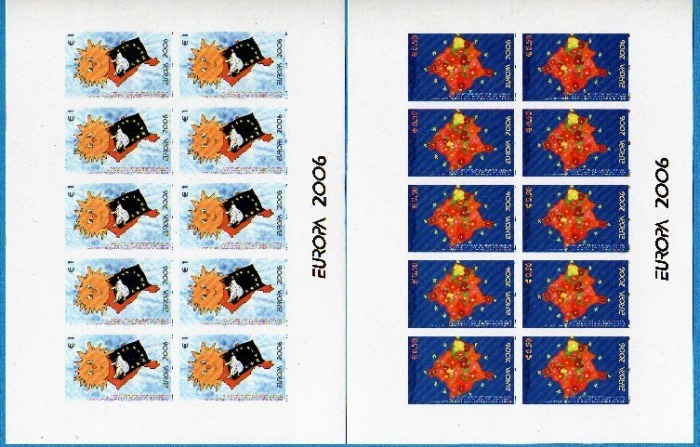 In 2009, the Kosovo Post issued a press release complaining that a Serbia-based stamp dealer was selling illegally obtained imperforate stamps. The Post listed the issues involved. They are listed below, and priced when available, because the imperforate versions, for the most part, also exist on officially cacheted first day covers cancelled with official first day cover postmarks. This implies official issuance or sanction. It is possible that cacheted envelopes may have been sold or given away free of charge by the Post, onto which collectors could affix imperforate stamps. The cancelling of the stamps with official markings presumably not released to the public indicates that a certain level of official sanction was given to imperforates in the market, especially those not listed by the Post as being "illegal". Certainly, postal markings can be counterfeited, but that is not thought to be the case here (based on examinations of the known covers) and that has never been asserted to be the case by the Kosovo Post. The Kosovo Post website notice says "It should be emphasized that among the forged postage stamps there are also original stamps bought by different stamp collectors and now sold legally". While one must make allowance for imprecise English, it appears that the Post is recognizing that legitimate imperforates could exist. Readers can see illustrations below of other issues (such as the Sports, Trains, Masks and the Children sets, all from 2007-8) that are in the market and have never been offered via the Serbian-based websites about which the Kosovo Post complains. The Kosovo Post's assertion that the imperforate stamps are "forgeries", also allowing for imprecise English, cannot mean that the Serbians copied images, made plates and printed counterfeits. Close examination of examples of the imperforates that come from these Serbian-based sites, all show that the screens/rasters and other characteristics of the imperforates (ink, registration, paper, etc.) match the characteristics of the original productions of perforated stamps that came from the three printers and that were sold via the Kosovo Post. If the material "escaped" from these "security" printer's shops by mysterious means, then all of the imperforates may be other than legitimate errors. Preparation of FDCs didn't occur at the printers' plants, of it is unlikely the printers were responsible for the existence of these items. Additionally, one printer (Leoprint), is a Kosovo-based company. It seems unlikely that it's staff would collude with Serbians who desired to get hold of imperforates and printer's rejects. The other printers, CPU & Moare of Bosnia (an entity politically less antagonistic towards Serbia) were more likely to participate in the deliberate release of material through back channels to Serbian website owners than Leoprint. All of this is speculative. Collector's will have to decide for themselves what to collect and what is or is not legitimate. Imperforate stamps offered here are sold on the condition that the buyer recognizes the nature of this material. Other Errors. No deliberate errors have been created by the Kosovo Post or UNMIK. Stamps missing colors have surfaced in the market, but this material appears to be printer's waste, press test material or other less than perfect production material singled out in the quality control process that escaped destruction. The only true "error" seen thus far is the 1€ Sport stamp from 2007 that has a misplaced country name in the center of the design. It appears on some sheetlets of 10, and consistently in position 1 on these sheetlets. It's not yet clear for philatelists how many sheetlets were in a printer's full-press sheet prior to it being cut and divided into sheetlets, so it's not been possible to calculate a total quantity of this error stamp that might be in circulation. So far, only a couple of copies are known in the market, both inadvertently sold over eBay in 2008 without the sellers having noticed the error.